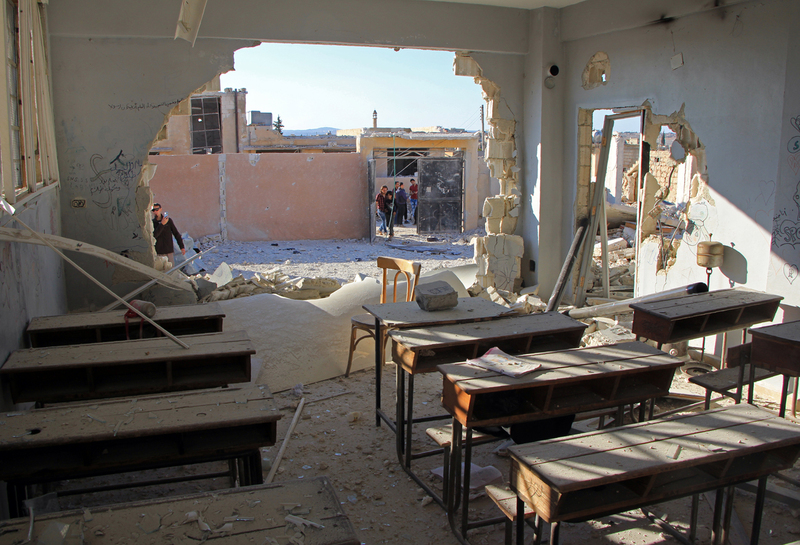 UNICEF, the United Nation's Children's Fund, has indicated three incidents of school bombings on Syrian territory between Oct. 22 and Oct. 28. A total of 22 children and six teachers died as a result of the Oct. 22 attack on the village of Haas in Idlib Province. The number of deaths from the two airstrikes on Oct. 27 is not known. UNICEF Executive Director Anthony Lake said that the events bear witness to the moral dissolution of the conflicting sides in the Syrian war. "Today’s reports of attacks on schools in Douma and western Aleppo should deepen our disgust and outrage. This brings the toll to five schools hit since October 11. Attacking schools … killing children … is simply inhuman. If the perpetrators cannot find their own sense of humanity, they should heed the condemnation of the world," said Lake, stressing that if planned then the attacks were a war crime that must not go unpunished. White House Press Secretary Josh Earnest said that Russia or Bashar al-Assad’s Syrian government forces were the only possible responsible parties for the bombing of the school in Idlib Province. “We don’t know yet that it was the Assad regime or the Russians that carried out the airstrike, but we know it was one of the two,” said the official U.S. representative. He added that even if Assad's regime had carried out the attack, it was only because it had Moscow's support. Then Russian Permanent Representative to the UN Vitaly Churkin expressed the hope that Moscow had not been responsible for the tragedy. "The easiest thing to do is say that it was us. But I am a responsible person. We need to wait and see what our Defense Ministry will say. This is really horrible. I hope it is not us," remarked Churkin. Igor Korotchenko, editor-in-chief of Natsionalnaya Oborona (National Defense) magazine, claimed that Western governments were making accusations in the media without presenting any evidence, despite statements from locals and rescue groups in the area cited by many media sources. "It is necessary to carry out a thorough investigation of the tragedy. For now we have the Russian Foreign and Defense Ministries' statement about Russia's innocence in this tragedy," said Korotchenko. Russian Defense Ministry Spokesman Major General Igor Konashenkov said that not one plane from Russia’s air force had carried out combat missions in Idlib Province or the environs of Aleppo in the last days. "We've analyzed the photos and video recordings of the so-called 'proof' of the destroyed school. The video recordings of the strikes on the Hass village that aired in a series of mass media sources are just a montage of more than ten separate shots, filmed with different resolution in various parts of the day," claimed Konashenkov. As Konashenkov explained, it can be seen on the AFP photos that serve as "proof" of the school's bombing that only the wall of a building is damaged, while all the desks in the classroom are standing. Furthermore, through the hole in the wall you can see that the rose fencing on the other side of the yard is fully intact, without any fragments from the destroyed wall having damaged it. According to Konashenkov, something like this “would not have happened” had a shell exploded in the compound. “The fencing and all the walls of the buildings would have been destroyed and marked with fragments and the furniture would have been blown away," he said. He added that on Oct. 27 a Russian drone had been sent to the vicinity of the bombing to gather information. "As we can see from the photo taken by the Russian drone, there is no damage to the roof of the school and there are no craters from the airstrike around the school. All this says that UNICEF's administration has become yet another victim of the fraudsters in “white helmets," said Konashenkov, in a reference to the Syrian Civil Defense volunteer rescue organization, which Russia’s defense ministry claims is fabricating evidence. In order to prove the authenticity of the information, he suggested that international investigators ask the Pentagon for equivalent data.